Discover why our customers won't go anywhere else to get the quality accessories they deserve. In addition to all of the manufacturers that we are dealers for (Ricochet Offroad, Kolpin, Pro Armor, EMP and more) we also provide you with our own line of products. It is all designed, fabricated, and assembled in the USA. We've been in the side by side business in one way or another striving to give our customers quality products for over 15 year. We are proud to say that our product can be found on every continent in the world besides Antarctica. Maybe we'll manage to get something down there one day! WhoMoto's biggest product is our roof line. Made of sturdy, 1/8” aluminum, they are thicker than many of our competitors tops. Being designed with rigidity in mind, our roofs don't need to be made of steel to handle whatever you throw at them. Weighing in at less then 60 lb for a crew roof, they are up to 100 lb lighter than similar tops made of steel! Once a week we get a call from customers saying their plastic roof blew off when trailering their brand new Ranger home from the dealership. We guarantee that will never happen to ours. To ensure your roof stays looking new even after a rough trail ride, they are sand blasted and then powder coated matte black. This prevents oxidation of the aluminum while providing a hard, scratch resistant surface. Installation is a breeze and will take you less than 20 minutes to install. Having a friend can helpful if you've got a crew roof. In addition to quality aluminum roofs, we also make both fixed and folding windows for many UTVs. Made of surface hardened plexiglass, they are more impact resistant than glass and more scratch resistant than standard plexi. Knowing many of our customers like to trailer their side by sides out to camps on the weekend, they are made to be easily removable. Simply remove the rubber clamps holding on the window (a less than 10 second ordeal) and throw it in the bed of your UTV or truck and be on the way to a fun weekend. WhoMoto's pride and joy are our MK series roof line. They are guaranteed to work with any Polaris accessory and are available in many models sure to suit your needs. Starting off the most basic roof is the MK1. It serves as the foundation for the rest of the MK series. Add a simple stereo system and you've got the MK2. Go full out with front and rear speakers, two LED light bars, and six LED pods, and you've got the MK9. Not sacrificing features for function, we hold these to the same standard as all of our products and guarantee these are the toughest roofs you can buy. Check out each of our MK roofs below and see just what your Ranger is capable of! MK9 - Go all out with front and rear audio, light bars, and more! 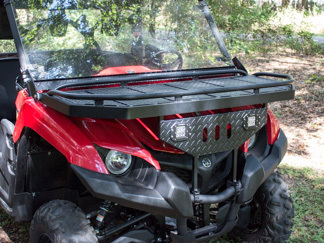 Besides the roofs and windshields mentioned above, we also make everything from bed liners to front racks. Simply hover over the side by side tab at the top of every page, find your model side by side, and make your UTV yours.